Lionel de Welles was the 6th Baron Welles. He was born into a family that was staunchly behind the Lancastrian claim to the throne in the early to mid 15th century. 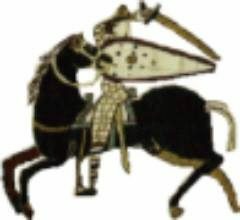 Holding estates in Yorkshire and Lincolnshire, he was one of the knights who took up arms in the series of battle fought in 1460/61. Lionel met his end, like so many others, at the Battle of Towton. His remains were carried back to Methley, near Leeds, which was part of his family’s estate. Here he was interred in a flamboyant tomb that is still ornate to this day. The story of Lionel de Welles interests me not so much because he fought and died at the Battle of Towton, but rather for the way in which he was memorialised. The Lancastrian defeat at Towton was crushing. Many lords and knights were killed in the fighting. Others were unceremoniously executed in the immediate aftermath of the fighting. The vast majority of these men, and the ordinary soldiers, would have been buried in mass graves around the battlefield. The body of de Welles is notable in that it was successfully moved from the carnage of the rout. Imagine the political situation in 1461. Edward IV has just become king. He announced himself in literature, through the Arrival and in highly visual form through the Edward IV Roll. These messages are accompanied by decisive political moves. The Lancastrians were attained, exiled, executed. Stripped of power, land and authority. Their positions and wealth handed to the victors. Methley was one of the many areas in which land ownership changed. Lionel may have been killed but the Act of Attainder included his lineage, so his son, Richard, was disinherited. This meant that there was the corpse of a former Baron, now an outlawed dead baron, in a village now controlled by the House of York. Furthermore it was close to Towton itself, and York, where there remained a large military presence from the Yorkist Regime. What was left of the Lancastrian cause had by and large fled to Northumbria. What would happen to the body of Lionel? Amazingly his body was interred in the church at Methley. 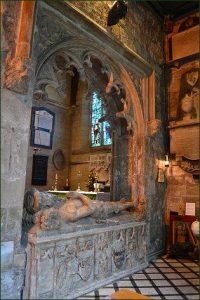 Not just quietly buried in a corner of the graveyard; not in a simple or even unmarked grave; no, he has interred in an ornate tomb in the most prominent of positions within the church. A tomb that illustrates his military role, he has a sword by his side, and his allegiances, through the crests carved into the stonework. It is quite astonishing that such a piece of funerary could be afforded by a family under attainder. Even more astonishing that it could be constructed and installed in a church under the nose of the new landowner, or his local representative. Consider too the risk taken by the locals in permitting this. Burial of the dead in a Christian manner would hardly cause much upset, even for someone attained, placing clearly Lancastrian symbols on the tomb in the heart of an area that had just been seized would not be accepted lightly. How did they get away with it? This is a question that I hope to find an answer to as I study the consequences of the Battle of Towton. He is buried with his first wife at Methley. His second wife however was one Margaret Beaufort, grandmother of a certain Henry Tudor. 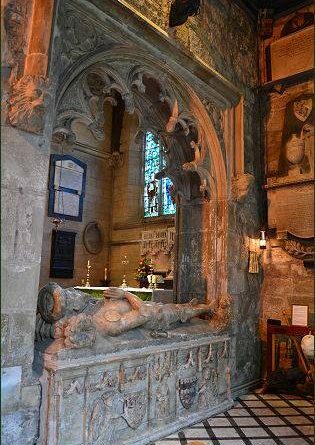 For anyone so closely tied to the Lancastrian line(s) to be granted such a grand tomb with political symbols upon it strikes me as very odd indeed for the period of Yorkist rule.